The hand made crystal carafe with walnut tincture in a beautiful ruby color. 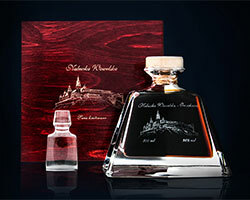 Sweet drink with walnut comes from the limited edition under the sign of Nalewka Wawelska®. The trustful Polish brand attaches to the carafe a ticket number that correspond to a unique number on the carafe bottle and it's signed by the manufacturer. The set is delivered in a hand-made luxury packaging of natural wood.